We offer—and recommend—an alternate route for some of this section. During the summer months, the county of Sonoma installs temporary bridges over the Russian River in several spots, and this is one of them. Making use of this summer crossing puts the route on a much prettier, much quieter road that is a big improvement over the frontange road by the freeway. The works crews typically install the bridge around Memorial Day, but that is not a certainty. It may be as late as late June, depending on a number of variables. The bridge will stay in place and open until the onset of the rainy season, around the end of September. You will know whether the bridge is in place when you come to the junction with Washington School Road (which leads to the bridge). Large signs at the corner will leave no doubt as to whether the road is open or closed. If it is open, drop down the hill on Washington School, traverse a short gravel stretch, cross the bridge, and continue along River Road (one of at least three River Roads in the county). This nice road meanders along very pleasantly, with steep, wooded hills on the right and vineyards on the left. If you stay on Asti Road, near the freeway, you will skirt along the eastern edge of the town of Cloverdale at around mile 9 before turning right and crossing the river. The routes rejoin on a last section of River before it bends east and then south and becomes Geysers Road. If you are the fit, self-sufficient cyclist mentioned above, you may feel a loop of only 42 miles is a bit short (never mind how hilly it is). If you feel this way, we have two optional add-ons to pad your miles and your climbing today: Pine Mountain Road and Pine Flat Road. Both are dead-end out-&-backs. One is near the beginning of Geysers Road and one is near the other end. Because we are at the beginning of the road now, here is a brief note about Pine Mountain: it is just over six miles, so a 12-mile round trip. It is mostly uphill outward bound and often quite steep. It gains 2200’ over the six miles. There is one small descent outward bound which turns into a 300’ climb on the way back. It is even more remote than the Geysers. There are lovely views now and then along the way and a remarkable forest of mature madrone trees...the biggest, densest pure madrone grove we’ve ever seen. Now back to the Geysers. This is a wild, rugged stretch of country, with the road sketched very tentatively along the rocky cliff face of the canyon. A violent geology below ground and extremes of weather above pound on this hilly, unstable terrain in an unending assault on the hard work of the local road crews. It’s a rare year when there aren’t a few washouts or landslides somewhere along this section of road, usually mended with a few truckloads of gravel. The main ascent of the Geysers is divided into three different sections, each with its own personality. First is an 8.5-mile section with numerous short ups and downs in the narrow defile of Big Sulphur Creek canyon. None of these climbs is particularly long, though some are steep for short stretches. In between are level runs and several quite substantial downhills, the final one dropping to an old iron bridge over the creek. This first section may be our favorite. The canyon is beautiful, especially if one takes the time to slow and peer over the edge into its rocky depths. In some spots, peering into its depths is unavoidable: the road narrows to one lane and the almost sheer drop-off into the canyon is hard to ignore. Beyond the bridge, the second section of climb settles down to a steady 4.5-mile, 800' grade that is never steep, nor ever level. It is almost entirely shaded by leafy trees and is quite pretty, with little brooks splashing down to the road to join the bigger creek below. Finally, at mile 13, the road turns abruptly right at a junction with Geysers Resort Road. That name gives you a hint of how this active geothermal area was originally exploited: folks came to take the steaming waters. Now the area is entirely closed to public access and is devoted to the production of electricity from steam generators, the largest such project in the country. You can’t fail to notice the miles of pipes snaking over the otherwise empty hills and the steaming power plants off on distant ridges, and sometimes the rotten-egg smell of sulphur from the steam vents. 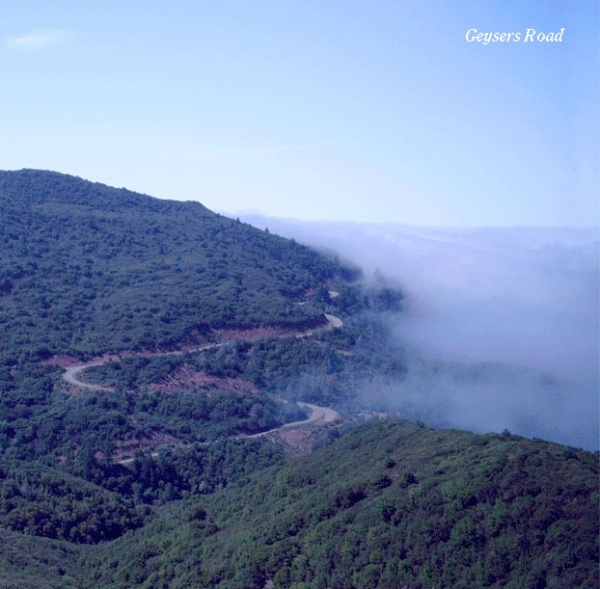 After the hard right turn at the junction, you begin the third leg of the Geysers climb, and this is the nasty one: over 750' in 1.5 miles. Somehow those numbers don’t capture the severity of this climb. It’s an unrelenting wall for the entire distance and will leave most good cyclists gasping for air near the top. For moderate riders, it will be the hill from hell. But then, almost anyone can put up with almost anything for a mile-and-a-half, and many non-hammerhead cyclists have successfully pedaled up this pitch without blowing a gasket. Once at the top, there is a blessed flat section where one can recover before climbing a few more small, less steeply canted hills. During this ridge-running section, we pass the sign for the “town” of Mercuryville, sometimes described as the highest town in Sonoma County. In fact, it is a no-place. Just a driveway leading to a single home, population two. There is an actual summit to Geysers Road at around 2700', but it doesn’t announce itself very clearly. After a series of small climbs and smaller descents, you eventually find yourself going downhill big-time, and by that you can surmise you’re on the other side of the mountain...but not quite done with the climbing, however. After a very fast descent of a couple of miles, the road tilts up again for another climb of over a mile (not too steep), followed by another good descent and still another small climb, all the while surrounded by some of the prettiest, emptiest country... rarely even a mailbox, let alone a house, to indicate any human element in this vast, rocky, rumpled landscape. In the middle of all this emptiness, there is a roadside watertrough, which is filled from a nearby spring. Cyclists used to refill their bottles here, but in recent years, the water has been tested and found to be unfit for human consumption: bacteria, mainly. Some still will drink it, but most consider it too risky. Finally, you’ll arrive at a second summit beyond which lies nothing but downhill for almost five miles. This is one of the best descents to be found, but first you have to negotiate the two sections of rough gravel about half a mile into the descent. The road is well engineered and the pavement is generally very good, lending itself to full-tilt fliers. Two thoughts before you go ballistic: just because we say it’s a ripper descent doesn't mean you can throw all caution to the wind. 50-mph speeds are possible on certain sections, but there are also many technical turns and several cattle guards to catch you out, and from time to time, the same gremlins that wash out sections of pavement on the north end of the road will lay booby traps for you here as well...some of them extremely nasty. Also (second thought), spare a moment or two on the way down to check out the panoramic view. It’s spectacular, taking in all of the Alexander Valley and Russian River Valley and much more. 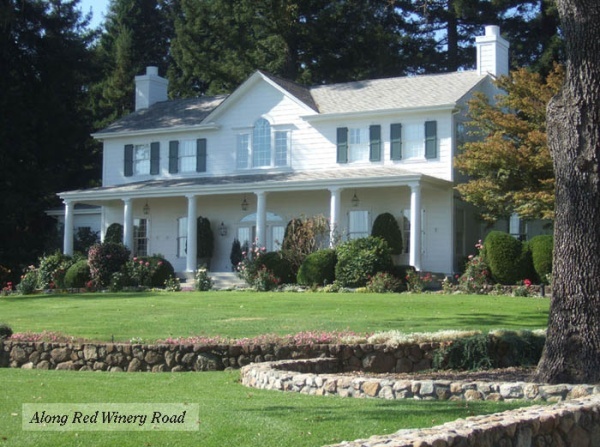 Once this wonderful downhill comes to an end, you’re at the junction with Red Winery Road. Now, for several miles, the route travels flat and mildly rolling roads through thousands of acres of some of the best vineyards in the world. 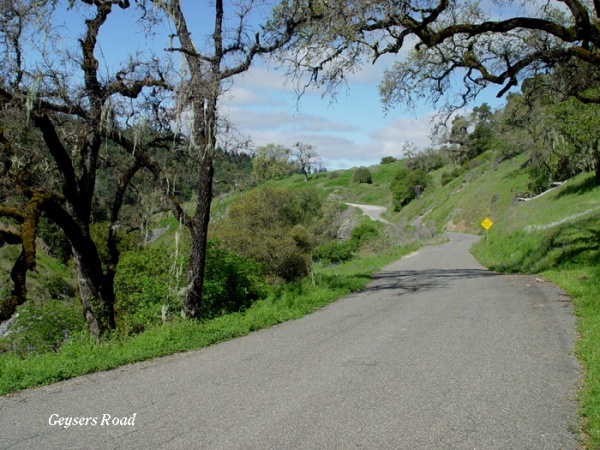 When pretty little Red Winery Road ends, it tees into Pine Flat Road, mentioned above as a potential, additional out-&-back. Pine Flat climbs 2000' in 7.5 miles, then levels out for a few miles and finally climbs another 1000' in a little over a mile, for a total of 12 miles...24 miles, round trip. This last pitch is brutal. It may be the steepest climb in the county, topping out at a leg-breaking 20% for long, painful stretches. Usually, when cyclists do this road, they stop at the 7.5-mile level, where there is a superb view over the valley. Pavement on this road, at least in the lower half, is very good, and that, taken with the slinky curves and just-right gradient, makes this descent one of the best in the entire North Bay region. If you like descending, this one is a must. After a brief run on Pine Flat, the basic route tees into Hwy 128. The route turns right on the highway and heads west and then north. Hwy 128 will be our home all the way back to the finish in Geyserville. Just a fraction of a mile into your 128 run, you come to the town of Jimtown, which essentially adds up to the Jimtown Store. This is a regular stopping place for cyclists in the wine country, with benches in front for basking in the sun, and a water spigot for filling bottles up the alley at the side. Inside is a delightful store, combining antiques, goofy gag gifts, and real general store merchandise under one handsomely restored roof. Best of all, there is an excellent deli-style lunch counter with a changing menu of delicious cuisine. After a stop at the store, you continue on 128, heading north up the valley, once again with tall, wooded hills on the right and the flat and rolling vineyard acres on the left. There are no more steep hills on the dance card today. All the remaining miles are either flat or gently bumping up and own over little rollers. Recross the Russian River just east of Geyserville and then roll into the little town, journey complete.